Their ridiculous demands torpedoed the negotiations. 彼らのばかげた要求で交渉はぶち壊しになった. Borrowed from Latin torpēdō (“a torpedo fish; numbness, torpidity, electric ray”), from torpeō (“I am stiff, numb, torpid; I am astounded; I am inactive”) +‎ -ēdō (noun suffix), from Proto-Indo-European *ster (“stiff”). Cognate with 古期英語 steorfan (“to die”), Ancient Greek στερεός (stereós, “solid”), Lithuanian tirpstu (“to become rigid”), Old Church Slavonic трупети (trupeti). (military) A cylindrical explosive projectile that can travel underwater and is used as a weapon. 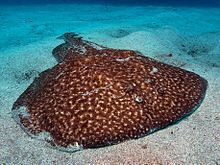 A fish having wings that generate electric current, a kind of electric ray. (archaic, military) A naval mine. (obsolete, military) An explosive device buried underground and set off remotely, to destroy fortifications, troops, or cavalry; a land torpedo. (slang) A professional gunman or assassin. (rail transport, US) A small explosive device attached to the top of the rail to provide an audible warning when a train passes over it. To send a torpedo, usually from a submarine, that explodes below the waterline of the target ship. To sink a ship with one of more torpedoes. To undermine or destroy any endeavor with a stealthy, powerful attack. torpeō (“I am stiff または numb”) +‎ -ēdō. The modern torpedo (historically called an automotive, automobile, locomotive or fish torpedo; colloquially called "fish") is a self-propelled explosive projectile weapon, launched above or below the water surface, propelled underwater towards a target, and designed to detonate either on contact with it or in proximity to it.